Sad to let you know of the passing of Les Jefferson. He died peacefully with family by his side. Les was 78. Condolences from all at the Vsaq to the Jefferson family. Funeral will be held on Thursday 19th November at 11am. Mt Gravatt Cemetery Memorial Chapel. 582 Mains road Macgregor.. All are most welcome to attend. The Vsaq 2015 Christmas Party is fast approaching. Sunday the 29th November at the Acacia ridge Hotel. Numbers and payment $50.00 p/p required by Tuesday 10th November. Looking forward to a great day tomorrow (Sun 18th October) at the Indian Motorcycle Museum and the display of Speedway Bikes/Sidecars,. 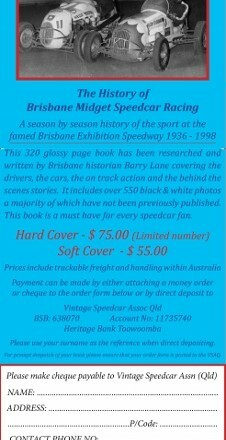 Sunday the 27th September Barry Lane will launch his book “Wheel to Wheel” the history of Brisbane Midget Speedcar Racing at the famous Brisbane Exhibition Speedway 1936-1998. 320 pages with 550 photos. 9.30 am at the VSAQ cluhouse 29 Market Street Newmarket. Book available in Soft & Hard Cover. To Vsaq Members and their Guests i would like to advise the Bare foot Bowls afternoon on Sunday June 21st has been cancelled due to a booking mix up at Salisbury Bowls Club. All Vsaq members who recieved the May newsletter please be advised a couple of events have changed. The open day for speedway bikes and sidecars listed for Sunday the 23rd of August has been posponed to October. The new date will be confirmed shortly. Also the date for our September event is now Sunday the 27th September……Apologies for any inconvenience . 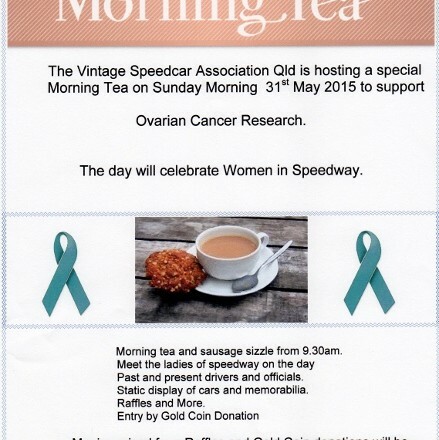 The Vintage Speedcar Assoc Women in Speedway Morning Tea for Ovarian Cancer Research is tomorrow Sunday 31st May. Everyone is welcome to come along and enjoy the morning.You never know who you might meet. From 9.30am at 29 Market Street Newmarket. A Memorial Service for Don Randel will be held on Friday the 22nd of May at 11am. The Service will take place at Mt Cotton Garden of Rememberance 1771 Mt Cotton Rd Carbrook. All are welcome to attend and the family would like anyone who wishes to say a few words or share memories to feel free to do so. Enquiries can be made to John 0408070384 or Robyn 0409881308. 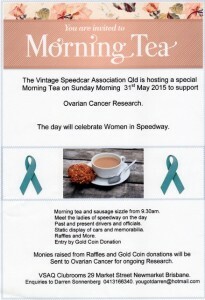 Remember to keep Sunday Morning the 31st May free for the Vintage Speedcar Assoc Qld Morning Tea. 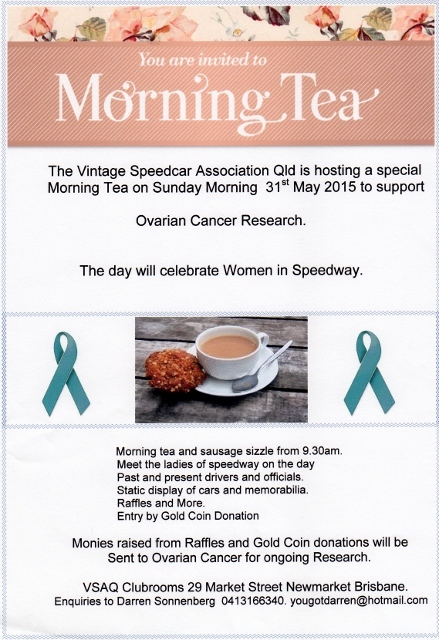 Monies raised will be sent to Ovarian Cancer Australia to support ongoing research. Invitations have been and are being sent to guests for the day and static displays are being organised. Along with Speedway displays we will have Tara from Younique Cosmetics, Nadine from Fitfh Avenue Collection and Jacquelyn from Shoe Wonderland to add a special touch. We are really looking forward to a very enjoyable day. Speedway returns to Caboolture this Saturday 28th March 2015. Vintage Speedway demonstration runs and static displays. Speedway will return to Caboolture on Saturday the 28th March 2015. Come along and check out the Static Displays and Demonstration runs of the magnificent Vintage Speedway Cars, Bikes and Sidecars. Cars .Bikes and Sidecars on display from 1.30pm withDemonstration runs starting from 3.30pm. 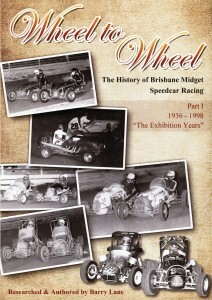 Vintage Speedcar Assoc Qld General Meeting for March will be held on Tuesday the 10th March at 7.30pm. Members guests and visitors welcome.. 29 Market St Newmarket. The Vintage Speedcar Assoc Qld will have a display of Vintage Speedcars and Solo Bikes at the Indian Motorcycle Museum this Sunday the 15th March from 9am. Members please note that the last newsletter had the Indian Museum display on sunday the 22nd March. We had to change that date after the newsletter was printed. The correct date is SUNDAY the 15th MARCH..